I expected our 12+ months in Dubai to be a slog, working very long hours, living in a huge, faceless, wealth-obsessed metropolis. I left the UK with two toddlers in tow in February 2014 after a long winter of rain, ice, relentless spiralling debt and post natal depression. What I found was a revelation, as well as our chance to turn our lives around. We now owe nothing to the student loans company or the banks (mortgage excepting) and have only three individuals left to repay, I’m off the medication and we have a bright future ahead of us. We have nearly turned it around out here in the land of opportunity for the hard-working. If only everyone had such a chance without having to forsake the country of their birth to do it! We didn’t just find nearly endless sunshine (which definitely helps!) but also a wonderfully welcoming and accepting atmosphere of industry, warmth and wisdom. Almost everybody I have met here has a story, and a compelling reason to be here in Dubai, from the young Brits working hard, playing hard and saving up to come home with cash for a deposit, to the bright young Asians growing careers and supporting families in India, Pakistan and the Philippines. I am talking about Dubai, not to gloat, but because I think that we can learn some valuable lessons from how other countries are run. A number of our closest neighbours in Europe can afford to have both free higher education and a prized national health system without crippling the poorest sections of society with austerity, so why can’t the UK when our GDP is about the same? The UAE has a much higher GDP than the UK, and people seem so much happier. I think that a significant factor contributing to this is that wages are higher. Much higher. Here, Western, Eastern and African ex-pats alike are all able to earn enough money to have a better standard of living than they would have in their own country and are still able to send money home (or pay down debts in our case). The happiness and higher wages don’t come simply from limitless oil-wealth (less than 7% of Dubai’s GDP comes from oil) but also from the vision and drive of its leaders, and the people really do love their leaders. I used to joke, when hearing people moan about how “x-section of society shouldn’t be allowed to vote for whatever reason”, that the ideal system of government was surely a “benevolent dictatorship” (where a far-seeing and compassionate king-like figure takes advice from counsellors but has ultimate power which he or she wields for the genuine best interests and happiness of all his or her people). 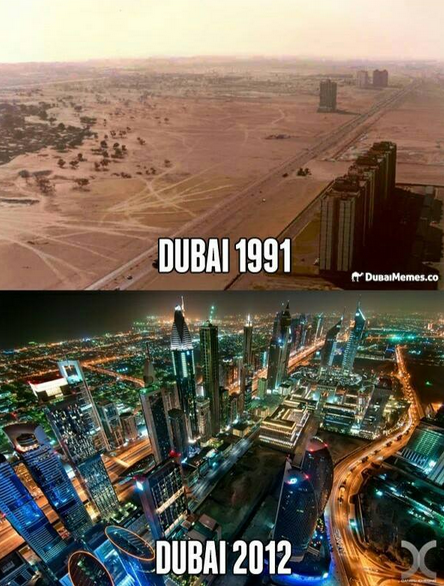 Dubai has as close to that as surely exists in the world. Sheikh Mohammed seems to be an inspirational leader and a great man and is the source of the following pearls of wisdom. The following quotes are from Sheikh Mohammed’s latest book (Flashes of Thought) which moved me to tears a number of times. I am in no position to judge the author on any level, but there are some real gems of wisdom and compassion here which all leaders (especially leaders of countries and the EU) could do with meditating upon. (I tried to cut it down, but failed, don’t feel you have to read to the end, many are here for my personal reference as much as anything!). “‘Impossible’ is a word coined by those who do not want to work, or rather, those who do not want us to work…it is a word used by some people who fear to dream big. It is like chains that tie a person down, hindering his every move…preventing him from moving around, living life and achieving great heights. Not what you were expecting? Me neither.